Strength for the Journey: A Guide to Spiritual Practice by Renee Miller, New York: Morehouse Publishing/CREDO Institute, 2011, 134 pp. This tiny little volume contains tiny little introductions to 20 different spiritual practices, along with a rubric for introducing and beginning each one. It is produced by the CREDO Institute, which runs the CREDO program of mid-career personal, spiritual and vocational development for clergy in the a variety of mainline denominations. The book is intentionally lightweight and light reading. The 20 spiritual practices are grouped into five categories: Meditative Practice, Ministry Practice, Media Practice, Mind Practice and Movement Practice. Each section and each practice begins with a beautiful and simple color photograph, which invites you to slow down your reading for information and simply reflect on the invitation into spiritual practice. The author follows a formulaic approach to each one, offering a brief rationale for the gift and struggle of that particular practice; practical suggestions for how to begin to engage the practice and what to expect in the discipline; concluding with a short observation about what personality types will be draw to or resistant to a particular practice, and the stumbling blocks each might encounter. I especially appreciated the inclusion of both ancient, traditional practices and contemporary, creative ones. Alongside praying with beads or praying the daily office, there is attention to technology, even movies as a possible spiritual practice. Movement practices do not just include walking and nature, but handwork. Ministry practices of hospitality and caring are joined by spiritual attention to money and gratitude. Miller’s reflections made me want to try a few practices I had not sampled or engaged with any depth. She spoke with an honesty about the difficulty and reward (or lack thereof) of spiritual practice, emphasizing that it is not about obtaining a certain feeling or holiness, but about the way the practices take root in your life and shape you by the discipline you exercise in doing them to give attention to God. Her whole style had a sense of encouragement and accessibility I appreciated greatly. I will be returning to this book throughout Lent, as I am preaching a sermon series called “A Lived Faith,” which is about inviting people into a life of spiritual practices, with a particular focus on those practices that we, as a congregation, should embody in an international, expatriate context. This is a book easily read in one sitting, but best consulted and savored slowly and spaciously. Craven and cruel. That’s the only way I can describe the GOP leadership in the U.S. right now, and the unchecked decisions they are making that impact us all. As Christians, how do we respond? First, the evidence of cravenness and cruelty: deliberately pursuing policies that break up immigrant families; offering aid and comfort to white supremacists while refusing to pursue justice for people of color; passing tax laws that increase income inequality; legislating in the interest of billionaires and corporations against the needs of everyone else; dismantling public lands, institutions and resources; attacking law enforcement and intelligence agencies who uncover crimes by those on their side, while manipulating evidence against the other party; denying health care to children for political gain; ignoring the women who accuse leaders of sexual assault and harassment; claiming faith as a reason for discrimination against LGBTQ people and women’s reproductive health; abiding untruth and advocating lies; rejecting asylum seekers and refugees fleeing violence; stripping protection for our shared air, earth and water; and so much more. An ocean away, I struggle to know how to resist this movement toward selfishness and callousness. I’m not there to organize or intercede in the resistance movements. But I realize one of the most important things we must be doing to fight cravenness and cruelty is to form people in the way of Christ, which demands sacrifice, compassion, love of neighbors and enemies. In order to stop this movement of brutality and selfishness, we will need people of moral courage, generosity of heart, truth-telling, sacrificial commitment, and deep kindness. We need to BE those people, steeped in those habits of love, joined together with others of many faiths and no faith, to maintain our common humanity in this time. While I still look to engage publicly in movements of justice and peace, I am feeling a renewed passion for my original calling–to engage people in the work of discipleship. The forces of cravenness and cruelty abide everywhere around us, not just in elected officials. We must each be a counter-force of courageous compassion, in the places where we live and work as much as in the streets and legislative halls. How can we, in the church, help form people in the habits of love, equipped to speak the truth, moved to care for the earth and for one another even as those around us mock and deride those values? With this question deep in my mind and heart, I’m planning a Lenten study and sermon series on faith practices and holy habits. It might look innocuous and apolitical to talk about prayer, service, friendship, breaking bread, bearing witness. To me, though, it seems like a return to this most basic work of formation is the strongest bulwark we can build against the urgent drumbeat of callousness, cruelty and cowardice. These practices give each one of us the tools to immediately and locally resist the forces of hate and indifference, in ourselves and in the systems (large and small) we inhabit. Discussion welcome. Political screeds and personal attacks are not, and will be deleted. Faith Formation 2020: Designing the Future of Faith Formation by John Roberto, LifeLong Faith Associates, 2010, 218 pp. Faith formation is one of my passions in ministry. How do we help people come to know the Christian life? How do we teach the stories of the Bible and the patterns of Christian living? The ways of faith formation are changing dramatically now that we live in a post-Christendom world, where young people can grow up having never heard even the basics of the Christian story. I was eager to read Faith Formation 2020 for insights about how to respond to this new reality and strategies for successful faith formation in the church. John Roberto is widely regarded as an expert in this field, and has successfully helped many churches adapt their programs and grow their ministries. Will people be more or less receptive to Christianity and involved in churches in the next decade? The remainder of the book is dedicated to sixteen strategies to address the various scenarios. The strategies include things like attending to milestones in people’s lives, engaging in service and mission as a path toward faith formation, organizing faith formation by generation, teaching discipleship by mentoring relationships and using digital media and technology. Within each strategy, Roberto identifies how it works with people within each of the four scenarios, how their particular needs will be different, and how the strategy can be adapted for them. There are many, many practical ideas, well-tested programs and useful techniques. It took me an absurdly long time to read this book (a month), and even longer to get around to writing this review (another month). I think that’s because the whole thing left me feeling quite overwhelmed. It took me awhile to grasp the way that the factors, uncertainties, scenarios and strategies all related to one another and to me. I love big picture thinking and categories, but even so this was a lot to comprehend. However, the overwhelmed feeling did not subside once I understood the concepts. Roberto’s approach breaks down just how different the faith formation needs are for different groups of people, especially across the four scenarios. I see each of them at work in my congregation and community, and I feel moved to respond to people across the four quadrants. However, unlike Roberto, who works predominately in Catholic parishes starting with 1,000 families, I am looking at a congregation of around 200 people, about 80 in worship on Sunday. It seems an impossible feat to organize faith formation unique to each scenario and life stage when you are only dealing with two to four people in each category. Reading the book made me feel a burden of scarcity–in resources, time and energy–about faithfully meeting the needs of such a wide range of people. At the end, I am still left with that uncertainty about how faith formation can take place in a smaller congregation. Yet I know that I cannot let my feelings of scarcity rule–our God is the God of abundance. I leave the book appreciative for the depth of understanding it offered about the various spiritual needs and concerns of people in the different scenarios. I will be attentive to that in my ministry. I will adapt some of the strategies in our work together, and think about how they work for people in different places in life. I still leave a bit overwhelmed with it all, which is perhaps the only proper response to the rapidly changing times in which we live and do ministry. I recommend this book as food for thought to people in all settings and sizes of ministry, because Roberto’s analysis of the landscape is unparalleled. But I caution the reader: you may find yourself overwhelmed by the vast work that lies ahead. Thankfully, our God is bigger than we are. 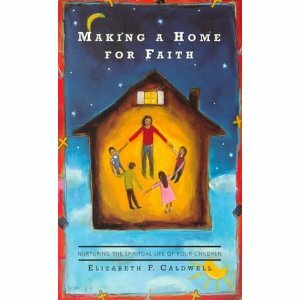 Making a Home for Faith: Nurturing the Spiritual Life of Your Children by Elizabeth F. Cardwell, Pilgrim Press, 2000, 118 pp. I was seeking a practical guide with strategies for integrating faith into our home in age-appropriate ways. While this book did contain that information, it was buried in a surprisingly dense, academic style. Caldwell spends a good portion of each chapter providing a literature review, surveying everything from developmental theory to models of faith formation. This is far better suited to religious professionals or academics than parents wondering how to teach their toddler to pray. I like theory, I like academic texts–it’s just not what I was expecting here. However, if you’re willing to look for it, there is much insight within the book for parents imagining how to pass on their faith to their children. One of the most insightful things she offers are two “top-ten” lists. The first is a list of what every child needs from faithful parents. It includes things like parents who are comfortable living their faith, participation in a faith community, faithful adults outside the family, and help making connections between faith and life. The second is a list of what parents need to know or do in order to pass along faith to their children. This list would make an excellent starting point for parents and church leaders seeking to equip them to be their children’s primary religious educator. It includes things like reading or telling a Bible story, praying, asking and answering questions, maintaining their own spiritual practices, and explaining the sacraments and liturgical year. Although each chapter comes with questions for reflection and discussion, I would not recommend giving this book to a group of parents for a small group discussion. The tilt toward scholarly sources and away from simple stories would not work in most settings. However, this book would be an excellent starting point and resource for Christian education teams or pastors or religious educators trying to develop strategies to help parents teach faith to their children. The ideas and information it contains could easily be translated into a series of workshops or classes for parents. Changing the Conversation: A Third Way for Congregations by Anthony B. Robinson, William B. Eerdmans Publishing Company, 2008, 199 pp. Anthony Robinson is among my favorite authors when it comes to explaining the changes facing the world, articulating their impact on the church, and raising the questions that we all need to contemplate in response. In this book, he takes it farther, drawing some conclusions about what mainline congregations need to do to engage with this new era. In Transforming Congregational Culture (one of my favorite guides for leading change in the church), Robinson makes the case for why change is necessary and hints at the kinds of changes that will be required. Changing the Conversation is a tool to help congregations launch the conversations that will engage the work of transformation. The premise implied in the title is that congregations have been having conversations for the last few decades about whether they are liberal or conservative in their politics, traditional or contemporary in their worship style, emergent or established in their way of life. Robinson labels these conversations ubiquitous, unhelpful and even destructive. (4) The third way moves beyond “either/or” into “both/and.” How can we be about faith formation AND social justice? How can we be about personal transformation AND public transformation? How can we be serious about scripture AND about reason? The path he charts guides congregations around those unhelpful conversations and into new ones, conversations that will move the church forward into a new way of life. Much of the material was familiar to me, both from Robinson’s other books and from a myriad of authors addressing similar topics, like Brian McLaren, Diana Butler Bass, Phyllis Tickle, and Gil Rendle. However, this book is unique because it condenses all that material into short, topical chapters that are perfect for discussion with leadership groups in congregations. I ordered copies of this book for every member of my church Council, and we are going to be working through these conversations throughout the coming year, one chapter at a time. Subsequent chapters address more specific questions: leadership and governance, vision, purpose, mission and public role, stewardship and faith formation. One of the most important things for me in this book was the chapter on a church’s purpose. Robinson traces a variety of authors (including each of the Gospel writers) on the purpose of the church, such as making disciples, changing lives, embodying Christ’s way of life in the world, glorifying God. All of these are variations on a theme. In a workshop with Robinson I attended on Sunday, he put it this way, “we’re in the people-making business,” making Christians not just by conversion but by a steady, shaping way of life. I think clarity of purpose is critical for all congregations, because it should shape everything else. Our purpose guides what we do (and what we don’t do), and how we go about it. We need to be clear on it, and reiterate it over and over again in everything we do as a church. For my congregation, this will be our starting place. We developed a purpose a few years ago, but we have not revisited it recently. While I may have read or heard many of these ideas before at multiple clergy workshops, and while our church has already been doing this conversational work together over the last five years, it will still be new to many of the Council members reading this book throughout the year. For me, it is a reminder that the conversation needs to be ongoing, not just a one-time thing. Most importantly, this book (far more than many others) does not just lament the past or imagine the future in vague and dreamy ways. Robinson’s questions and model of congregational conversations offers a path for practical, local, immediate and meaningful ways for real churches to engage with change. Rather than feeling overwhelmed, I finished Changing the Conversation thinking, “we can do this!” I can imagine my church having all these conversations, and, with the help of this book, we will. 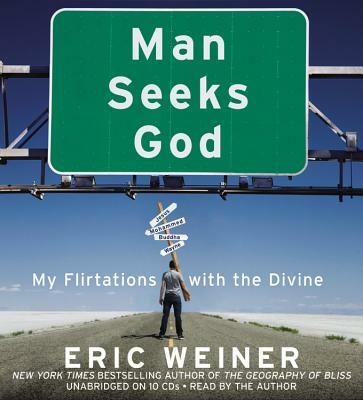 Man Seeks God: My Flirtations with the Divine, by Eric Weiner, Twelve: Hatchette Book Group, 2011, 349 pp. I can’t remember where I heard, saw or read the review of this book that made me want to read it. When the library e-mailed me to tell me that it was my turn to pick it up from the reserved list, I had forgotten it was there. I do remember that I thought it would help me better understand the world of the “nones,” the growing segment of people in the United States with no religious affiliation. I think it did. Eric Weiner is a writer and reporter (for The New York Times and NPR, among others) who has never had an active life of faith or participated actively in a religious community. Although his heritage is Jewish, he has little connection to it as lived religion. When Weiner has a health scare, the nurse in the hospital asks him: “Have you found your God yet?” He has not, and that realization leads him into a deep depression and a quest around the world, trying on religious practices of all shapes and sizes. I suspect that his brief summary and new category of Confusionism matches the description of many people raised in a secular environment. However, in my experience, few are willing to admit their ignorance and confusion, content instead to believe the stereotypes and caricatures about various religious traditions. I thought at first Weiner’s book might be a bit of religious tourism or even a bit of sarcasm, drawing out the extremes for (appropriate) mockery. But his story and his quest were genuine, and in the end, it’s his openness and honesty, his willingness to try anything, that gives the book its heart. Weiner gives himself over completely to each faith he explores—physically, if not always mentally (which is a much bigger challenge for all of us). He tries the major players—Buddhism (Tibetan), Taoism, Christianity (Franciscan), Islam (Sufism) and Judaism (Kabbalah)—but he also goes for some newer, non-traditional alternatives, like Wicca, shamanism, and Raelism. He criticizes and even lightly mocks when it is appropriate, but he also gives each practice credit for what it offers. In the end, he discovers what religious practice is capable of. Far more than a set of rules and regulations, it is a path to an encounter with the numinous, the Spirit, the Divine. Along the various roads, Weiner finds those sacred moments, and through his skepticism he honors them with awe. This book is well-written, entertaining, creative and insightful. Through Weiner, I do feel like I got a new kind of insight into the “nones,” but also an interesting window into the various faiths he visits, including my own. 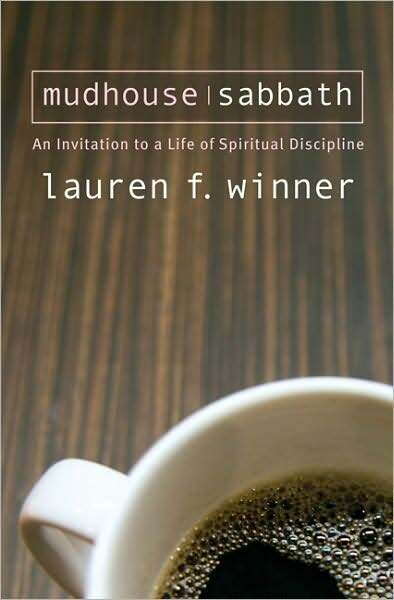 Mudhouse Sabbath: An Invitation to a Life of Spiritual Discipline by Lauren F. Winner, Paraclete Press, 2003, 161 pp. Last week, a high school friend who I had not seen in nearly 20 years contacted me on Facebook to let me know he was passing through my town, and invited me out for coffee. It was a delight to catch up, and the conversation flowed free and easy even after so many years. For me, it was a special treat to talk to someone who knew me before marriage, motherhood and pastoral life—as if he could unlock a more primitive version of myself, one that I have already unearthed a bit during this sabbatical time. As it always seems to with me, conversation turned toward the realm of the spiritual and the religious. (I realized in this reunion that this sort of thing always happened way back in high school too, not just with him but with all my friends. I guess my calling was inevitable.) My friend described himself just like he did in high school—not a believer, but someone with a deep fascination and appreciation for the spiritual realm and the mythos of religion. He expressed a sentiment like, “I wish I could believe, but no one has been able to show me more than the man behind the curtain.” At the time I responded somewhat pathetically with a torrent about liberal Christianity, welcoming doubts, honoring questions and joining as Jesus-followers even if we weren’t sure what we believed. What I really should have said, and what I am coming to believe ever more deeply, is the premise of Mudhouse Sabbath: that religious life (aka spiritual life) is not about belief, it’s about practice. Following a religious tradition is not about conforming your mind, it is about cultivating a way of life. Religious life is about taking on habits of living that have led seekers to God and transformed wayward souls into faithful followers for millenia. Whether we believe or do not believe, whether we “feel it” or not, religious practitioners continue to follow these ways of life—not because we have a blind allegiance to tradition, but because the practice of spiritual discipline shapes us in ways that make belief possible and mystical experiences knowable. Lauren F. Winner’s Mudhouse Sabbath is a unique approach to this ongoing conversation about practices of faith. Winner was raised in an observant Jewish household, but converted to Christianity as an adult. She loves her Episcopalian church life, but misses the disciplines of her Jewish roots. This book, then, takes a look at a host of Jewish spiritual disciplines, compares Jewish and Christian practices, and imagines how Jewish ideas and habits might shape a Christian spiritual life as well. It is important to note that Winner begins the book by refuting my claim about belief versus practice. I am no longer convinced of Winner’s claim that the practices do not make us Christians. I do agree that our spiritual practices do not justify us—God’s grace does that. However, I question how we can call someone a Christian when they believe all orthodox doctrine, but do not let it influence their life decisions in any way by practicing love, generosity, prayer and compassion. The same is true in reverse: if you follow Jesus as the shaping influence of your life through acts of love, generosity, prayer, compassion and worship, but you are not sure what you believe, I think you are still a Christian. In this light, I doubt Winner would disagree, but it is something I continue to wrestle with, as someone whose life often has more doubt, more practice, and less confident belief. None of that is the heart of the book, however. Winner’s book is primarily a description of the Jewish spiritual disciplines, a comparison to Christianity, and an invitation to Christians to make these practices a part of our lives. She describes eleven different practices: Sabbath, fitting food (keeping kosher), mourning, hospitality, prayer, body, fasting, aging, candle-lighting, weddings and doorposts (hanging mezuzot on doorposts). What drew me to her book was what has always drawn me to Jewish spirituality—its embodiedness. So many traditional Christian spiritual disciplines (prayer, meditation, lectio divina, silence) focus on the mind and spirit. The practices Winner describes are much more physical—stopping work on Shabbat, caring about the kinds of food we eat and how they are prepared, placing physical markers in our homes and on our bodies to remind us of our faith. I have always been cautious about adapting any of these practices as my own, since I am not grounded in the community that shapes them. Winner has opened the door for me to imagine ways to incorporate these kinds of practices into my Christian life, with an appreciation for their Jewish origin and not a presumptuous attempt to imitate Judaism. I wrote recently about the spirituality of housework, which works for me in the same way as the practices Winner describes and reminds me of the Shabbat preparations she discusses. This is a great introduction to spiritual disciplines that is accessible to everyone. It is a short book that would make a great subject for a church book discussion group or Sunday school class. I hope you enjoy it as much as I did.